Peugeot reveals 308 CC | What Car? 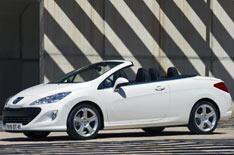 This is the new 308 CC, which will go on sale early next year. The four-seater will be unveiled at the Paris motor show in October and is expected to cost around 300 more than the equivalent hatchback models. There will be a choice of 150bhp 1.6-litre turbocharged petrol and 140bhp 2.0-litre turbodiesel engines. Features include a folding metal roof that retracts in 20 seconds, a six-speed manual gearbox, roll-over bars that pop out in an accident, an innovative side head airbag and a heating system that blows warm air through the front headrests. The car also comes with a built-in MP3/CD stereo, Bluetooth connectivity and sat-nav.